You'll be £19.99 closer to your next £10.00 credit when you purchase The Dutch in the Medway. What's this? Order within the next 20 minutes to get your order processed the next working day! The daring raid on the Medway in June 1667, when the Dutch navigated the treacherous shoals and sandbanks of the Thames estuary and the Medway in order to attack King Charles's ships laid up below Chatham, was one of the worst defeats in the Royal Navys history, and a serious blow to the pride of the English crown. Perhaps the greatest humiliation was the removal by the Dutch of the flagship Royal Charles, towed down river after the raid and taken back to Holland. Her stern piece resides in the Rijksmuseum in Amsterdam to this day. The raid, intended to bring to an end English procrastination at the peace negotiations in Breda, was to cause simmering resentment and lead eventually to the Third Dutch War. As Pepys wrote in his diary on 29 July 1667, Thus in all things, in wisdom, courage, force, knowledge of our own streams, and success, the Dutch have the best of us, and do end the war with victory on their side. P G Rogers account of the raid, and its significance within the Second Anglo-Dutch War between Britain and the United Provinces of the Netherlands, is vividly told and he sheds much interesting light on the English navy of Pepys's day. His particular knowledge of the Medway and the topography of Gillingham and Chatham also enables him to describe the manoeuvres at a level of detail that has not been replicated. This edition of a classic work will delight a whole new generation of readers. Rogers writes crisply and economically, and permits himself to speculate only on who was to blame on the English side (pretty much everybody), and whether the Dutch should have gone farther (no – they withdrew at just the right moment). While the subject may be somewhat outside Warship’s normal time period, this is still a notable and worthwhile read. Rogers, who writers crisply and economically, notes that combined casualties on both sides were probably only in the few hundreds, not least because so many English simply fled. Philip Rogers’ original 1970 work coincided with the 300th anniversary of the Dutch attack on the RN’s main fleet anchorage in the Medway at Chatham and this 2017 reprint has been produced to commemorate the 350th anniversary of the attack. It is the latest contribution by Seaforth Publishing/Pen & Sword to making earlier works available to new readers at an affordable price. Many readers may have forgotten (or chosen to forget – see later) one of the most ignominious events in British naval history, the audacious raid by Lt. Adm. Michiel de Ruyter’s Dutch fleet up the River Medway to attack King Charles II’s navy in June 1667. His ships had been laid-up in the river just below Chatham in anticipation of a favourable conclusion to the Treaty negotiations at Breda to end the 2nd Anglo-Dutch War 1665-67. Why waste money fitting out ships that would not be needed in peacetime? Yet this is exactly what the wily Johan de Witt, Holland’s chief representative in the States-General of the Seven United Provinces, was doing in the period leading up to the raid. He also had his elder brother Cornelis installed as the States-General’s plenipotentiary (in fact a political commissioner) to make sure de Ruyter and the other provincial admirals would be vigorous in pursuit of their orders. The book does not just cover the raid itself, but begins by explaining the Anglo-Dutch maritime rivalry that had been growing from the time the Dutch had first tried to throw off Spanish control, initially with support from Tudor England. They finally won their independence in 1648. Yet within 4 years the English and Dutch protestant republics were at war. The Treaty of Westminster that ended this 1st War in 1654 settled nothing and within 5 years of Charles II’s Restoration in 1660 they were at war again. The author sets the scene of the deterioration of relations and the early course of the 2nd War before the laying up of Charles’ fleet to save money in anticipation of the peace settlement under negotiation at Breda. He then continues with the Dutch preparations for what they called De Tocht naar Chatham, while also describing the complacency, delay, pilfering etc. affecting the King’s ships and the Royal Dockyards. Whilst there are numerous accounts of the attack on Sheerness fort, the raid itself and the capture of the flagship Royal Charles, the author is careful to sift through these to avoid the many half-truths written for personal aggrandisement or to justify failure. Finally he covers what he called “the fruits of victory”, the honours bestowed on the various Dutch leaders and the recriminations on the English side with blame finally falling heavily on Navy Commissioner Peter Pett in charge of the dockyard and the Lord Chancellor Lord Clarendon, who fled to France. In the penultimate chapter (“Retrospect”) the author reviews the effects of the raid and the steps taken afterwards to try and ensure it could not be repeated. Yet once again the peace treaty did not settle matters and the two nations were at war again 1672-74. The author, Philip Rogers, who had served in intelligence in WWII and became a teacher after, entered the Foreign Office in 1948. He has produced a number of works of local history and also has an intimate knowledge of the lower Medway and its sandbanks, currents and tides from his experience in small boats. However The Dutch in the Medway, which he explains in his original Preface, was born out of a desire to put the raid in its historical perspective, is his best-known work. As J D Davies, in his Foreword to this 2017 reprint, reminds us, Rogers cultivated an extensive range of connections in the Netherlands and this contributed to his extensive research of source material in Dutch archives as well as British ones, which include not only the commanders and officials involved but also the noted diarists of the period, Samuel Pepys and John Evelyn. We are told that many Dutch histories of their “golden age” regard Philip Davies’ account as the standard account of the raid, rather than their own versions, praise indeed if it is needed. In an interesting Postscript, Davies commented on the 1967 centenary hat the Dutch saw the weeklong event as a “celebration” whereas the locals saw it as a “commemoration”. This chapter is another example of his even-handed approach. Overall, Davies’ original work is seen as a classic work which not only tells the story of the events of June 1667 and their consequences with fairness and authority but also achieves the author’s original aim of putting the raid in a correct historical perspective. Works about England’s naval failures rather than victories are not always well received but it is important not to lose sight of them if we are to remain aware of the consequences of a maritime nation running down its fleet. Perhaps this should serve as a warning to Britain in 2017. Therefore this is a thoroughly recommended short account of the events and well worth the reprint. 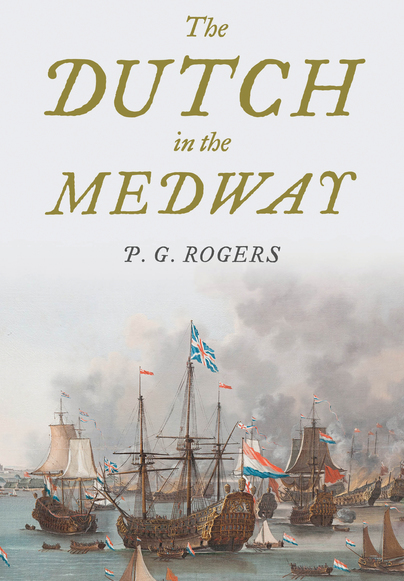 The Dutch in the Medway is a well-rounded, easy-to-read, and comprehensive presentation of the attack. The use of sources from both countries a non-biased account, and the insertion of quoted passages from primary documents adds to the recounting’s immediacy. Maps, footnotes, a list of sources, the index, and color plates depicting the attack and the people involved further enhance the reading experience. This book is also an invaluable addition to any collection on English, Dutch, and naval history. Read the complete 5* review here. For modellers researching for a possible model this book gives a full account of the politics of the time and the reasoning for many of the actions by the English and Dutch Navies. The Anglo Dutch war of 1667 is a subject I had not previously read in any detail. However this excellent volume is recognized even by the Dutch as the main authority on the audacious raid that humbled the British. My assessment is straightforward. The Dutch in the Medway is well worth reading, perhaps particularly at a time when we’re reconsidering our role as a trading nation and our relations with the rest of Europe. and just how bad it was for Britain. This book is a must for all who are interested in the days of sail, most highly recommended. Before reading this book you wonder why Seaforth would re-published a 1970 book. When you have finished it you'll say 'I'm glad they did'. The subject is one small but very important battle in the Second Anglo-Dutch war. The author places it in its historical context both the before and after. The writing style is such that reading it is easy, it is detailed enough for the military buff, but not at the expense of the general reader. The text is supported by sufficient maps and a few well chosen illustrations which includes a print of a contemporary map. The author's explanations and opinions are well supported by quotations, included in the text, from the writings of people at that time. His sources, listed at the end of the book, are many and varied. We thoroughly recommend this book. If you are left wanting to know more about the Royal Navy in the latter half of the Seventeenth century then 'Pepys's Navy' by J.D.Davies, reviewed elsewhere on this site, is the book for you. The book opens with a clear exposition of the political, diplomatic and strategic situation which led up to the Second Dutch War in 1665. We see how want of cash led to embezzlement, malversation and pilfering in a vicious circle which led to what funds there were being further diminished. Particularly explained are the shambolic Command arrangements on both sides although de Ruyter established firm tactical control of the Dutch fleet and its embarked forces. He, and his Government, were certainly rattled afterwards and we see the resultant unedifying witch-hunt and scapegoating needed to point blame away from where it truly belonged. The immediate result was our capital city in a panic; a political disaster at home, even though the effect on relative naval strength was minimal; and the loss of diplomatic position at Breda where peace treaty negotiations were continuing in the background during the raid. This is a very well-written and illustrated work and is a cautionary tale against failing to fund the first task of Government, the Defence of the Realm. PHILIP GEORGE ROGERS served in Intelligence in the Second World War and then taught history before entering the Foreign Office in 1948. A Man of Kent, he wrote a number of distinguished works of local history including The First Englishman in Japan, Battle in Bossenden Wood, The Fifth Monachy Men and The Sixth Trumpeter.